Whilst it may not be the first thing on the production agenda, one could argue it is an essential production tool today delivering at least two fundamental production values. Firstly it can save you money by reducing the time required to get that perfect take and secondly it means that your presenter will be word perfect (and legally compliant) with a professionalism that we all expect to see today by maintaining eye contact (through the lens) with the audience. This is particularly relevant when they may not do this “for a living” such as in Corporate Video and Event Productions. If you want to learn more I would recommend reading “The Teleprompter Manual” by Laurie Brown a good, easy read and if the web is more your thing the best information site, in my opinion, is Teleprompting Techniques (http://www. allaboutprompting.com/) prompting guru Chris Lambert’s site which gives you everything you need to know. I am relatively new to the business having joined Portaprompt in January after a lifetime with Sony (when occasionally I would use prompting myself). My fi rst learning is remembering that beyond the technology there is a crucial relationship between the Presenter and the Prompting Operator. Prompting technology has seen some fundamental changes over the last ten years with the move from CRT to fl at panel displays providing lighter and brighter camera head-up displays and we are still seeing change taking place. 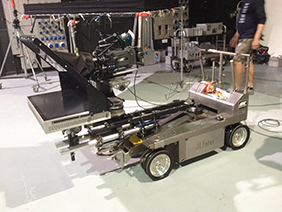 Autoscript are buying Autocue (an industry generic name), a new company Cue Script launched at NAB 14 and there are a myriad of new companies arriving with Tablet technologies. Out of this we are experiencing new questions and production language with examples being the Interrotron (what’s that?) 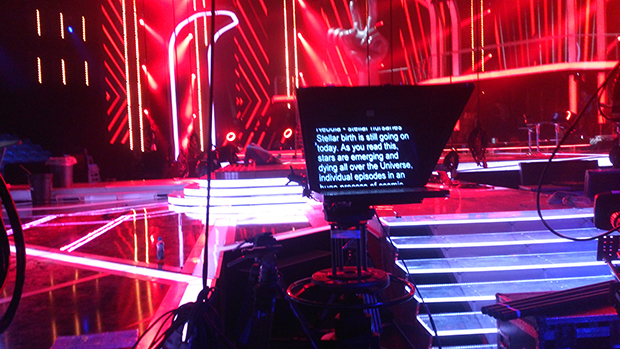 and an unusual call from ITV Productions that they need a 32” Prompting Display but with no words - what, why? So where this leads me is to ask the question, is prompting not just about words anymore and if so are we entering a new age? Traditional word based techniques and products are well established. On camera displays from 5” to 24”, rigging for any type of camera from large studio to new robotic pan, tilt and zoom (PTZ) devices, sophisticated software packages that can integrate into Newsroom workfl ows, conference products using large displays, motorised (rise and fall) conference poles and “Obama Glass” and of course the all-important Prompting Operator. The business model follows the standard Broadcast TV structure with day to day rental into production and programme budgets and infrastructure into capital budgets. This is as it has been and will continue (we believe) into the foreseeable future. But if the market is growing what are the technologies and techniques that are driving this? The fi rst thing to consider is the arrival of cost effective Tablet and Phone Prompting devices. These are not replacing the existing products but with prices starting at around £75 a day to rent and under £500 to buy these tools are opening up opportunities where traditional prompting may not have been fi nancially justifi able before. The fi rst wave of products have been around for several years now but in Europe have been a bit of a slow burner where as in the USA the company Prompter People claim sales of over 10,000 devices in their domestic market! First generation devices were rather limited but new tools are now pretty sophisticated and can be linked to full function prompting software packages like WinDigi from us and WinPlus from Autoscript. We have created a workfl ow with our 350 series whereby we create scripts in our WinDigi Software (which has far more functionality than the tablet based software), save the script to an FTP server, download them from the server to two tablets and through the i-scroll / glue device run two head ups simultaneously that pretty much a traditional style workfl ow! There are limitations as editing with dedicated tablet software can be a pain (de-rig the tablet, turn mirror mode off, make the changes, re-mirror and re-rig) but these software tools are either free or cheap and when combined with professional rigging provide prompting where prompting has not been before! We recommend the Pico Prompt App for Apple devices which at £14.99 from the Apple Store and when combined with Teleprompter Techniques’ i-scroll and i-glue devices you have a scrolling functionality that you would expect to have on conventional device and means that the Presenter is in control of the script rather than vice versa (which is never a good idea). Who’s using these types of devices? We have sold and rented into BBC and ITV for use on household name shows with tablets not replacing existing studio infrastructure but adding production value for location based programmes or inserts that previously would not have had considered using prompting at all and this is as equally true for the freelance cameraman who is shooting a mix of Broadcast and Corporate commissions and can now provide production value through prompting where it had not been financially justifiable before. Other growing sectors in the UK include the Education Market, the ever increasing online production markets (online channels like Football Clubs), the growing You Tube and Vimeo Social Media programme makers and the new Local TV Channels. The Interrotron - What is it? 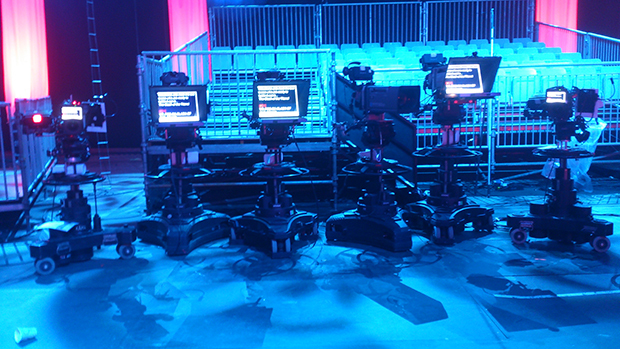 Today there are two variants, a Passive system which uses refl ections by way of a customised prompting hood and refl ector and an Active system which takes a video feed from a second camera feeding the prompter display. I wished I had known about this before as it would have been the prefect prompting tool for the in house video productions we used to produce for our channel and customers at Sony. Our presenters tended to be from our marketing team and whilst very knowledgeable on the kit and clients were not necessarily all great presenters and even when reading prompt some could be rather stilted. The Interrotron takes these limitations away so a Presenter can do a piece to camera through the lens but as if it was a two shot interview and are not intimated by looking just at the lens having a human face to react with! What I am fi nding is that this little known technique when understood adds real value at very effective costs. It moves prompting from just “reading words” to an interview style approach and builds confi dence to camera while maintaining the all-important eye line - a real production advantage! The 32” Picture Prompter. This may be a one off but I do think helps demonstrate how Directors and DoP’s are now using Teleprompters for applications other than words. The call came in from ITV Productions who wanted a particular look and feel for their World Cup Campaign Trailer. The idea was they would have a number of big close ups of supporters watching a TV game and wanted the refl ection of the TV they were watching refl ected in skin tone and eyes. We all supposed that this would be done in post-production but it worked out that using a prompting screen with a 32” monitor and shooting the reactions “through” the TV would give them, within the budget, the look and feel that they wanted. Conclusions At the start of this article I asked the question is this a new age for Teleprompting? Maybe that is a claim too far but what I hope I have demonstrated is that Teleprompting is providing more production value than ever before and that this can be word and image prompting. What next? We think the next big thing in prompting will be the adoption of IP technologies that allow operator and talent to be in different locations. The technology is pretty much ready to rock and roll but there are still concerns in production as to how this will work given the fundamental relationship between operator and talent and how any delay or latency can destroy this. If any of this pushed your buttons do give as a call at Portaprompt to see how Prompting could make a signifi cant difference to your next production. 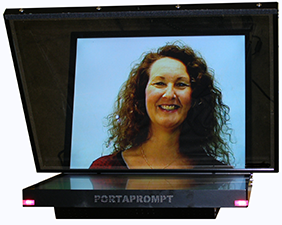 Jon joined Portaprompt, a boutique prompting company based in High Wycombe UK, as the Sales and Marketing Manager in January 2013. Prior to this he had worked for over 30 years with Sony Professional Solutions Europe’s in a variety of sales, marketing and senior management roles initially in the UK and since 1999 across Europe.